Personalized Arch Plaque with Ornate Cross - - two arch styles with a Christian Cross above the address. Personalized with a one- or two-line address, your choice of arch style, and your color selection. Wall mount. Made in USA. Two arch styles: Prestige with a flatter full-width arch (large image) and Classic with a more defined and centered arch (small images). The one-line Prestige arch holds up to five (5) 4" characters. Dimensions: 15.5"W x 10.25"H.
The two-line Classic arch holds up to five 3" characters on Line 1 and up to seventeen (17) characters on Line 2. (Note: Line 2 is optional.) 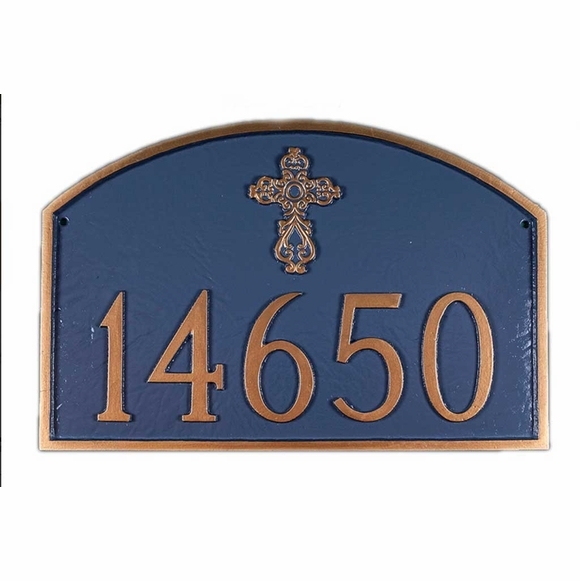 Dimensions: 16.5"W x 10.25"H.
Personalized Address Plaque with Christian Cross above the address. Comes in 26 different color combinations. Made in the USA.